Imagine more than a hundred balloons dropping on your child and all their party guests. Your children will have insane amount of fun playing balloon-themed games like trying to find that ONE special balloon that has a special prize! 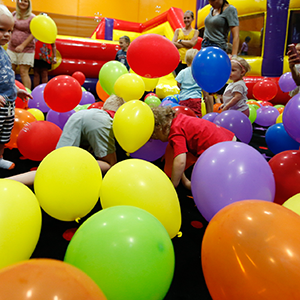 Add our amazing Boppin' Balloon Bash to your Classic/Deluxe or choose it for your Ultimate package to create a party experience you won't soon forget. 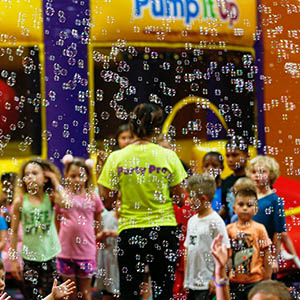 Top off your extra special Party with our Bubble Extravaganza! Our newest attraction will have kids competing in a bubble popping competitions. Run, Jump, & Pop the thousands of bubbles that will cover the entire party. Take your party up a notch with Glow WARS! Add it to any party or choose it as your Ultimate Experience for your Ultimate Package. This experience will include Glow in the dark laser lighting in our second arena, glow necklaces, and use of our special Glow Moon Blasters! Blast your enemies away and defeat them with our soft GLOW IN THE DARK pong balls. Create a memorable moment by seeing your child's eyes light up at the sight of their favorite character! Add a character to brighten up their birthday party! Character Appearance $75 for 30 min. Call to inquire about our offers! 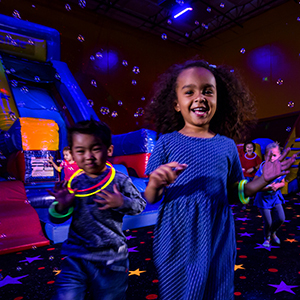 Book your kids birthday party today and add the Glow feature for special effects lighting in our second arena. Your birthday child will receive a Glow lumiton and each child receives one Glow accessory, usually a necklace. We have other various Glow in the Dark accessories available for purchase at the counter as well. 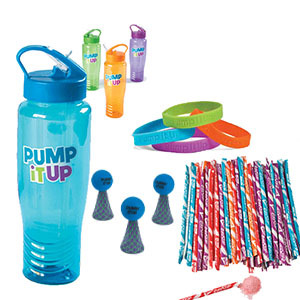 Pump It Up reserves the right to substitute items. Over 50 options to choose from! Call to inquire about themes! Superheros unite! Have your birthday child and all his/her guests test their mighty ability through the course of their party. They'll test their knowledge, speed, agility and imagination as they accomplish challenges and become THE BEST Superheros of Pump It Up! This package includes: interactive games, Superhero room decor, a superpower ID card and mask per child, and a special cape and wristbands for the birthday child. Ahooy all mateys! Have your birthday child and all his/her friends go through a quest to find the mighty treasure at the end of the party! Watch them discover hidden clues and gems throughout the arenas and even have a blast at our pirate-friendly Cannon Blasters. This package includes: interactive Pirate games, Pirate room decor, eye patches and inflatable swords for the kids, a mighty chest filled with treasure, and a special Pirate hat for the Birthday Captain. This birthday, give her the royal treatment! 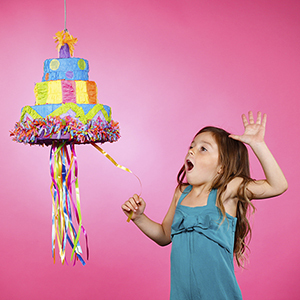 Looking to provide your child with an exceptional birthday treat? 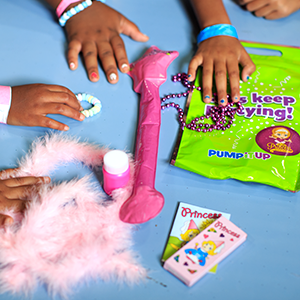 Watch your child engage their imagination as they transform and become a Real Princess! Your child and their guests will embark on a royal journey as they play, sing, and “act out” a Royal Celebration fit enough for a Princess! This package includes: fun and interactive Princess tests, an inflatable wand/ knight sword for each child, a treasure chest filled with surprises, and a special crown for the birthday child. 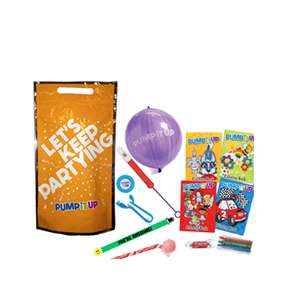 Keep the party going when they get home with a goodie bag filled with even more amazing treats including a Disc Shooter, Crayons, Coloring Book, Bouncy Balloon and more! Party on with a goodie bag filled with various prizes inside! 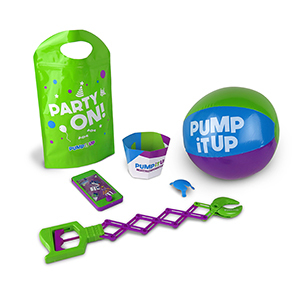 Included is a Bouncy Beach Ball, Nifty Claw Grabber, Cute Frog Hopper, and a Toy Cell Phone Game! 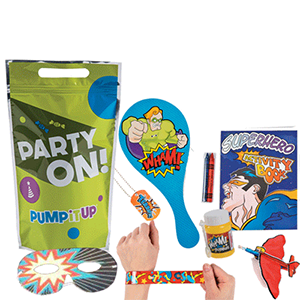 Gift your mighty superheros with this goodie bag that includes an Eye Mask, a Snap Bracelet, Bubbles, Dog Tag necklace, Paddleball, and more! It's a goodie bag with a twist! Kids get to take home a water bottle filled with fun treats inside! This is also used as part of our Glow Goodie Bag treat! Arrgh, Matey! 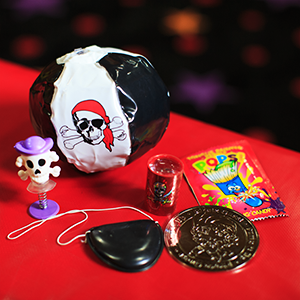 This treat comes with a Shiny Silver Coin, a Mini Beach Ball, Funky Telescope, an Eye Patch, Yummy Popping Candy, & a Bouncy Skull. Our Party Pros will capture your memorable moments so you don't have to worry! We take 80-100 photos that you will be able to download, share & email after the party!